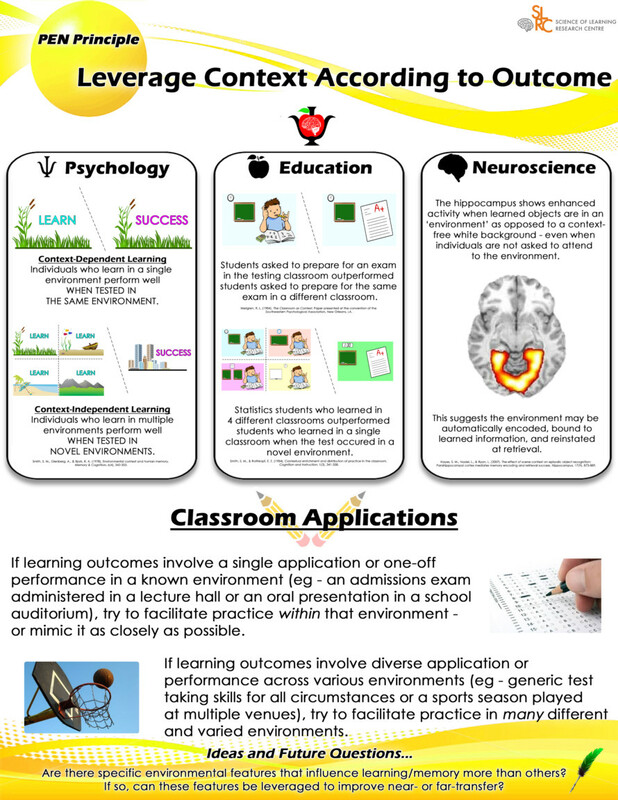 The Leverage Context According to Outcome message is among a series of new PEN Principles – Psychology, Education and Neuroscience – developed by Australia’s Science of Learning Research Centre (SLRC) to assist teachers, students and parents across the country. These researchers have been assessing a range of teaching and learning processes in an effort to develop science-based strategies, tools and information designed to improve Australia’s learning and educational outcomes. Their research has shown that students who prepare for an exam only in the room that the exam will take place, out-perform students who prepare for that same exam in different learning environments than where the testing will occur. However research also shows that students who learned in a range of different locations performed better if they were placed in an unfamiliar exam environment when compared to those students not used to learning in ‘away’ locations. Neuroscientists have seen that students who learn in a set environment demonstrate increased activity in the area of the brain linked to memory and spatial location. The research will hopefully assist teachers get the best results for their students by adjusting learning environments depending on the testing context.